These normally work independently, however, patients with some conditions or diseases have reported that sounds can cause vertigo (spinning sensations) and nystagmus (eye movements). In patients with SSCD, sound causes the fluid in the balance canals to move, which gives the person the impression that they are physically moving. This can be a minor and temporary inconvenience or a major disability. In many cases, the imbalance disappears when the condition is addressed. Hearing internal sounds like eye movements or walking. Some patients experience their eyes moving suddenly to compensate for an inner motion. 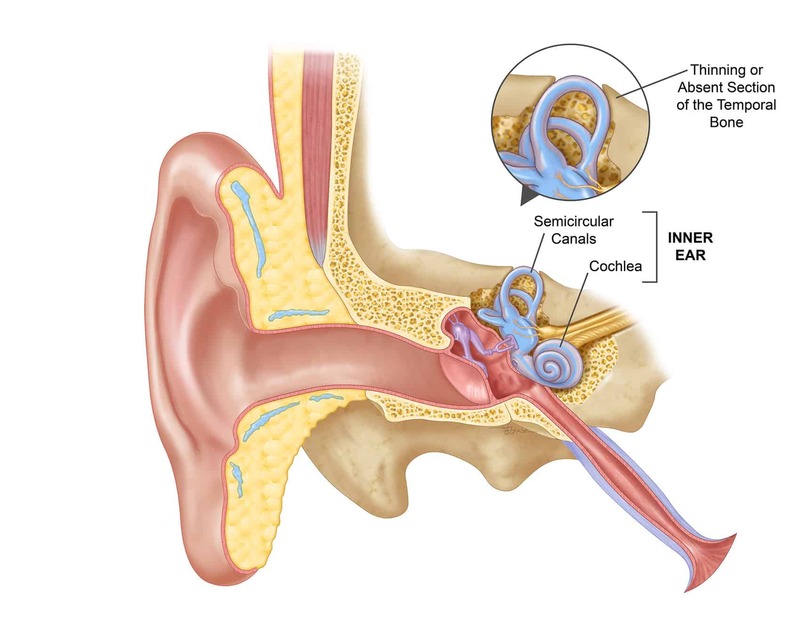 Sound normally moves the fluid in the cochlea which activates the hair cells and turns the sound into electrical signals. This same fluid is shared by the balance canals. Loud sounds change the pressure of the fluid in the cochlea and the canals. This may result in slight movement of the thinned bone, which is interpreted by the brain as physical movement. If the patient’s eyes are open, visual cues tell the brain that there is no movement. This confusion results in feelings of imbalance and, often, the eye movement. The cause of the condition is not fully understood. Some people are born with thinner bone over the superior semicircular canal, which can lead to the condition naturally or after trauma. Diagnosis includes a hearing test, tests in a vestibular clinic to assess eye movement, and usually a CT scan. Identifying the direction of the eye movements helps to determine if the problem is on the left or right side, while a CT scan can find the thinning bone. A number of patients have been assisted merely by the diagnosis, which allows them to avoid the condition/s that trigger an attack. After many years of living with the condition they are relieved to have an explanation. Professor Marcus Atlas and the team at Ear Science Surgery are experts in the surgical treatment of SSCD, and surgery to repair the thinning bone is often successful. This surgery must be performed under a general anaesthetic, and requires drilling through a section of the skull above the ear to block the ear superior canal and then use a cement to thicken the covering. This completely resolves the issue for most patients, and significantly reduces it for others. 33.Atlas MD, Lowinger DSG. The GP’s essential guide to hearing loss. Medicine Today. 2000;48-59. 32. Atlas MD, Lowinger DSG.Office of evaluation of hearing loss in adults. Medicine Today. 2000;117-119.